A long missing feature has been added to Sametime 8.5.2. 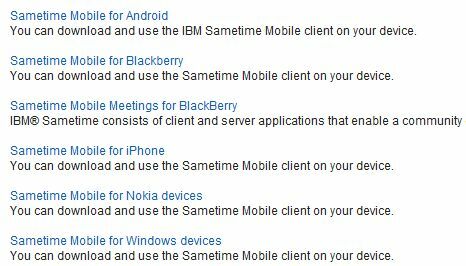 A client for Android devices is now available! There has been an alternative client for a couple of weeks called QuipIM, but I guess everyone has been waiting for the „real“ client, right? Now finally it has arrived. The documentation has been posted on the Sametime Wiki Pages. I will give it a try in the next couple of days with a detailed comparison to QuipIM and be back with first impressions. So stay tuned. Blackberry PlayBook – A real iPad competitor? RIM is about to release the Blackberry Playbook. It’s going to be shipped in the US and Canada on April 19th. But will it be a real competitor to the iPad (2) or Android 3.0 (Honeycomb) tablets? Let’s face it: A tablet is cool! It is state of the art and you have to have one nowadays, right? You sit on your couch and the movie is boring. What if you had a tablet to check your mails and twitter stream and to pass by planetlotus.org. Sure, you could take your smartphone. But is it as cool as a tablet and as enjoyable? NO! So, now that the iPad is not anymore the only tablet out there, which one should I get? Is the BB Playbook a real competitor to the iPad or Android tablets? I couldn’t lay my hand on a PlayBook yet, but there are a lot of people out there who did. Crackberry.com states that the PlayBook is a brand new and exciting Blackberry experience. Techradar.com says that in terms of being able to easily find and load apps, manage your music and videos, play games and browse the web, BlackBerry has an absolute gem on its hands. ITPro thinks that he best business feature of this phone though was the ability to link up with a BlackBerry smartphone via Bluetooth. Pocket-lint means from what they’ve seen so far, and having now actually used the PlayBook, they can see that it will appeal to BlackBerry users, but the slightly quirky approach that the PlayBook takes to connectivity and functions will deter those looking for a complete feature set. So, different opinions but a start for everyone thinking about getting a tablet to take the PlayBook into consideration. I found this video on youtube. This is one of the funniest movies I’ve seen recently. I had to share this.